Here it is, spring at last – you’ve stowed ice fishing gear and finally thawed out your toes. Next on the unofficial fishing calendar is trying to hook some largemouth bass if you’re in the country they inhabit. Currently, largemouth should be just starting to surface from their wintery deep-water dwellings into shallower waters to spawn. If you’re like me and looking for excuses to hit the outdoors as soon as you aren’t courting hypothermia to do so, here’s a rundown of how to snag a few wily largemouth before they hit the spawning grounds. One of the reasons these springtime bass can be so desirable is that the majority of the fish population in a given habitat is heading toward shallower waters. Spring bass fishing can present an unpredictable but target-rich environment. A largemouth bass that might be fairly habituated and hard to find the rest of the year is breaking from the pattern and heading for a place to dig spawning beds. Thus, an angler with a little savvy can look out for the best places to intercept the traveling fish with good chances of success. You might be thinking that that’s great in theory, but that things look a little different when you’ve actually got a line in the water. You’d be right, and for that reason, working knowledge of pre-spawn largemouth habits combined with some idea of the underwater topography is going to be your key to success. So, before we examine a specific plan of attack, here’s a rundown of basic spawning fish behavior. Your average largemouth bass will just be separating from schools in preparation for spawning when the water temperature creeps into the mid to upper fifties. For largemouth, whose eggs are sticky and can adhere to aquatic plants and structures, the ideal bedding location will be somewhere protected from the open water at large with plants, grasses, root structures, submerged trees, etc. available. Spawning beds will typically be between three and twelve feet down, away from currents and open water, preferably near food sources. Males will soon be heading on the prowl for prime spawning locations. The male will find a likely location in the soil and dig his bed before swimming out to herd a female back to the spawning bed and keeping her there until she has dropped some of her eggs. He will remain with the eggs for the two to five days it takes them to hatch and will then spend a few more days protecting them from predators until the males themselves begin to eat the hatchling fry out of hunger brought on by lack of feeding during the spawning process. For the females’ part, they will wait in medium depth water for the males to construct the beds, occasionally sunning themselves in the process. This sunning is largely to help incubate their eggs prior to spawning. Upon depositing eggs, the female will not hang around and will repeat this egg depositing behavior several times throughout the season. As the fish transition from their winter habitat to the energy expenditure of spawning, they are looking for food sources and are traveling far outside their normal relatively short range. The departure from routine is what can give an angler the edge when it comes to pre-spawn bass fishing. Next on the list of things you might be wondering is what you should be dangling in front of your fishy targets that are most likely to get them to take a nibble or two. An important note for any bass fishing endeavor is that largemouth are what are known as “gape-limited predators”, essentially meaning they’re opportunistic and not too picky – if fits it into their mouths, it’s dinner! I have found that tackle can be a matter of personal pride for some of us, so if you have something you swear by, I hardly think I will talk you out of it. However, I’d like to spend some time on the things to look for in your early spring bass fishing. Selection after that is up to your own judgment and preferences. Worth mentioning is the age-old debate about live bait vs. lures. While it may not be acceptable in tournaments of in some sections of your state waterways, live bait is an old standby that’s quite attractive to a hungry fish just coming out of winter. Live bait that is pretty good looking to the average bass could be anything from shad to nightcrawlers. The good thing about fish that aren’t picky is that anything live and prey-like makes for an attractive meal. A downside to live bait, however, might be its lack of visibility. Spring water is full of runoff and could be on the murky side. Thus, having something bright with lots of movement could be a good choice for the time of year. 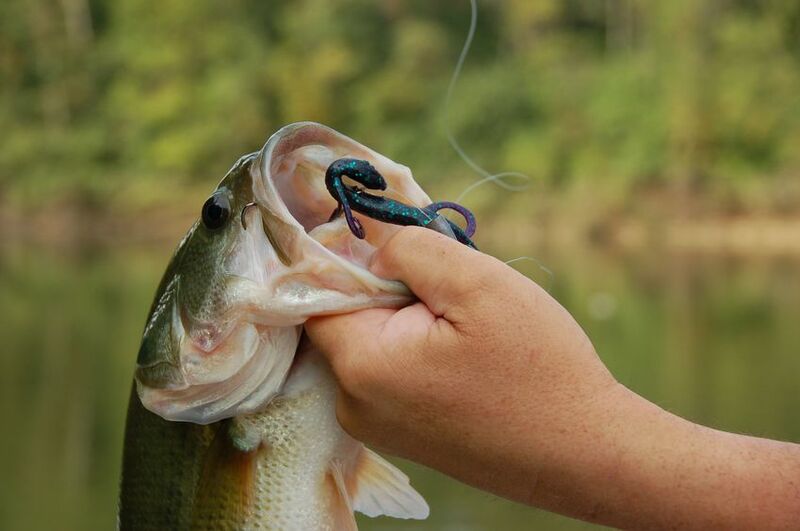 That way, even if your water is on the muddy side, the bait should be easily seen by bass. Aside from visibility, two other considerations for choosing your early spring bass fishing lures would be depth and weed resistance. Depth is important because you are trying to snag your fish as they travel from deep water to shallow water. For this job, something which dives a bit, but not too far is quite handy. Hanging at that medium depth as the fish are passing by should put you right zone. Weed resistance is important because debris in the water is common for the same reason the water isn’t crystal clear. Spring runoff will be swelling water levels, leaving obstacles like submerged trees and undergrowth, as well as loose debris washed in from shore. Rigging your tackle to make for easy removal from the snags bass like to live in and around just might save you some heartache. Based on all this info, here are a few of the most productive types of spring bass fishing lures that you ought to consider for your next pre-spawn fishing trip. Flashy Umbrella Rigs – These are highly visible pre-spawn bass fishing lures, and the imitation of a school of tasty morsels can be irresistible. Let one of these slide through that medium depth water within reach of structure like bridges, docks, and vegetation that’s likely to hold a few largemouth. Versatile Jerkbaits – Because female bass can be known to lay upon flats waiting to pair off for spawning, having something rigged weedless to dart in and out of shallower vegetation could seriously pay off. Realistic Crankbaits – If you want something to dive a bit deeper, a crankbait bearing more than a passing resemblance to a shad can be a great tool to draw out the deeper fish still lingering in cooler water. The Classic Casting Jig – This is a great standby that can be manipulated and rigged in a variety of ways. If you’re looking for a go-to when you can’t decide what is working best, this is perfect to have handy. Obviously, there is a multitude from which to choose but based on the habits of fish as well as some of the strategies which have been noted as consistently effective in the early spring, these suggestions should give you some new ideas for expanding your tackle. From taking a look at the habits of the pre-spawn, we can hopefully use this information to build a basic strategy for catching what might be otherwise elusive largemouth. The rest of the year, bass aren’t big travelers, often choosing to stay in a series of protected holes and coves, away from direct sun. Such habits mean that unless you know where the fish are, they can stay very well hidden. Largemouth aren’t typically just wandering past your lures all day. The pre-spawn is a window of unpredictable opportunity. Fish are breaking out of the schools they have wintered with and are traveling reasonably far in some cases. The confusion and tumult can mean that bass who are usually wily, are moving out of their safer patterns. It’s similar to hunting in the rut for deer or elk. Their hormonal focus can remove some of their natural cautions, allowing a hunter or angler chances otherwise unavailable. In discussing the spawning cycle, we know where the fish are starting from, where they’re ending up, and some locales in which they might hang out. Using this info, a fisherman can specifically target the likeliest paths of large groups of fish. Essentially, it’s a three-step plan. Locate where the bass are going: The first step is to determine several desirable locations on a lake for spawning. This means that sweet spot of three to twelve feet of water depth, with lots of cover and food opportunities. Find out where the schools are originating, such as the deeper areas of the lake: Here it’s really handy to have a fish finder which can be used to gauge water temperature and depth. If that technology is not available to you, knowing where a current is flowing and possibly following an old stream or riverbed can be invaluable. It might take some trial and error. Cast into the area between these two locations that contains the most favorable bass habitat: This means finding areas of less direct sunlight and more protective underwater structure. Largemouth by nature, seek out places to lay up which offer an optimum balance between food availability and places to stay hidden. Here your choice of pre-spawn bass fishing lure or bait can be used as a way to specifically target a sector of the fish population. For instance, if you find that there are a number of traveling fish in an area, dangling an umbrella rig of shad in front of them could be enough to stop them in their tracks. Conversely, your conveniently weedless-rigged jerkbait could be the best thing for snagging fish first coming up to the shallows in search of spawning bed locations. Creativity and improvisation are the names of the game. Fish are hungry and aggressive this early in the year, making for memorable landings. While it may lack in the predictability of the warmer seasons, early spring can offer a chance to stretch your abilities as an angler for a shot at a great fight with a monster largemouth. Despite the fun to be had hunting down the pre-spawn bass, that unpredictability can have its drawbacks. Water temperature is a major factor in fish behavior this time of year, and its fluctuations can change bass responses day to day. An unexpected icy rain and frosty night or two could slow fish movement until the water temp rises more steadily. The fact of the matter is that you could just plain get skunked. With fish so far out of normal routines, they just might not be where you are looking, even if you’ve done your homework and made some solid plans. Fish are still fish, driven by spawning urges and hunger or not. Whatever happens, sticking with it is the key to success, and it may take some time to learn about the behaviors of fish in a particular body of water from season to season. 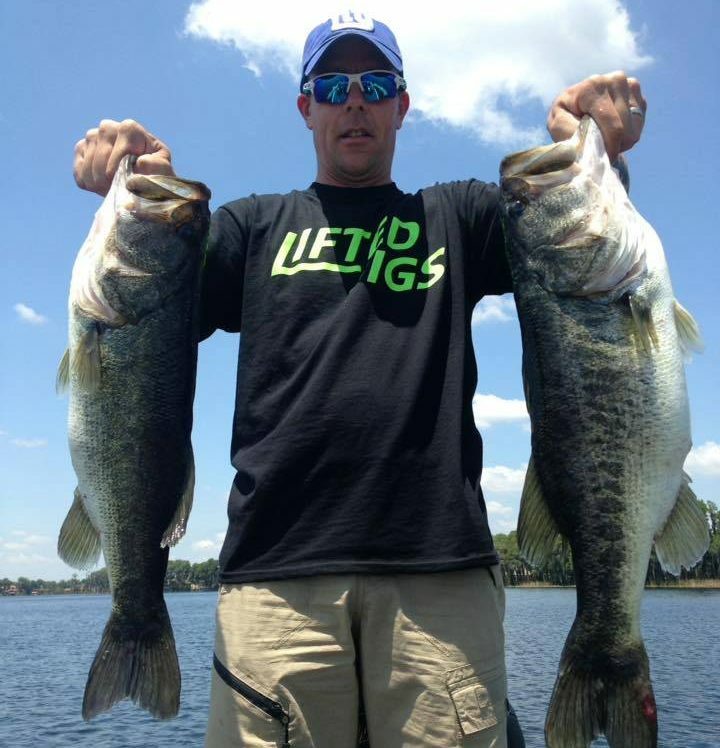 Hopefully, this has given you some tools and tricks to improve your chances at success in your next early spring outing for largemouth bass. But really though, do you need much convincing when I’m hand delivering another excuse to head to the lake, pole in hand? The moral of the story is that you should pack a raincoat and get out there! Pre-spawn largemouth represent what can be some fast and fun fishing whether it’s for the next family fish fry, or it’s catch and release. If you (like me in years past) aren’t starting the fishing season early enough to take part in this stage of the life cycle, you’re missing out. However, you make your plan of attack, having one more excuse to hang that Gone Fishin’ sign on the proverbial door is worth it! This entry was posted in Bass Fishing, Fishing Tips & Other Wonderings on April 12, 2019 by Dorado. So much great information. I’ve been active in fishing for a while now, but have never really thought about the techniques that you shared. For example, casting into the areas where the fish are most likely to be seems like a no brainer; however, I never thought about that. Thanks so much! You’re welcome, Darrel. Yeah, sometimes we tend to overlook what’s right in front of us. With bass, particularly pre-spawning largemouth, studying and knowing their habits is key to success. Glad the article was helpful. Thanks a lot for putting this together John! I was looking for a great recommendation for some new rigs that will attract some spring bass and am going to try out the one you recommended. I love the site as well. Hi Thomas, and thanks. There are many great rigs, lures and baits for early spring/spring bass. You just got to try a few and see what works best for you in the particular body of water you’re fishing. Good luck!